Ah, Shrimp and Blue Cheese Pasta, just the name really tells you all there is to know about this delicious, rich, and decadent pasta dish that I know you and your family will love. It’s definitely too rich to have often, but it is perfect for special occasions or when you have company. 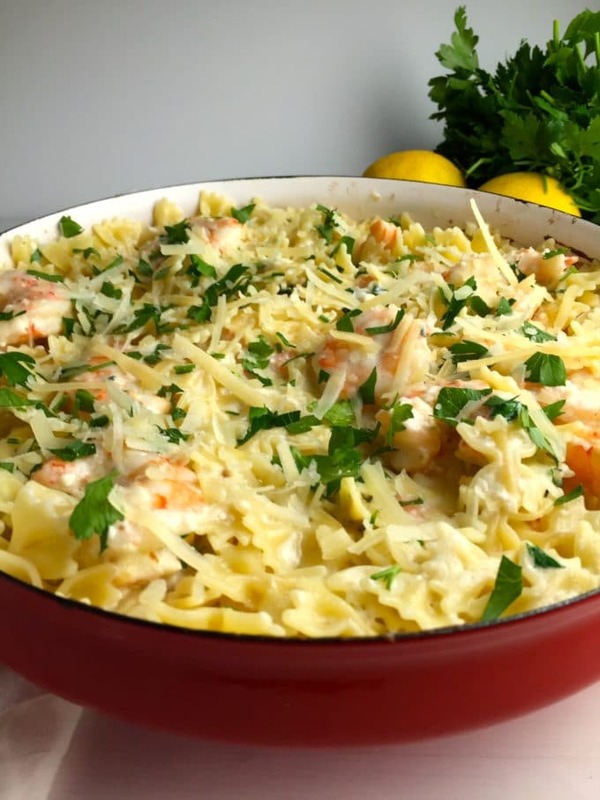 My two favorite food groups are seafood, especially shrimp, and cheese and this dish combines both in a quick and easy pasta dish that will have you out of the kitchen in no time to accolades from your family and friends. I’ve always heard that it was an offense of the highest magnitude to combine seafood and cheese on the same plate but never understood why. Apparently, this subject is hotly debated and originated from taste preferences and geography, especially by Italians. But I’m in the camp that believes it can be done and this scrumptious Shrimp and Blue Cheese Pasta is a great example that proves what a wonderful pairing it can be. My inspiration for this recipe is a similar one, Buttery Blue Shrimp in A Thyme to Celebrate, a cookbook by the Junior League of Tallahassee. I’m in a cookbook club and our June hostess recently chose this cookbook for each of us to make a dish from; I must say all were absolutely delicious. Other yummy dishes made from this cookbook at our luncheon included Perfect Corn Dip, Tomato Basil Tart with Spinach, Tortilla Pie, Gruyere-Thyme Potatoes, Summer Garden Chicken Pasta, and my contribution Roasted Tomatoes with Feta Cheese, Olives, and Pine Nuts, which I will be sharing the recipe for in the next few days. Oh, and last, but certainly not least, we had the most wonderful Coconut Cream Cheese Pound Cake for dessert. Can you see why I’m in this club? Anyway, my point is, when I saw the recipe for Buttery Blue Shrimp, it called my name and I knew that I would be making some variation of it. And, here it is! 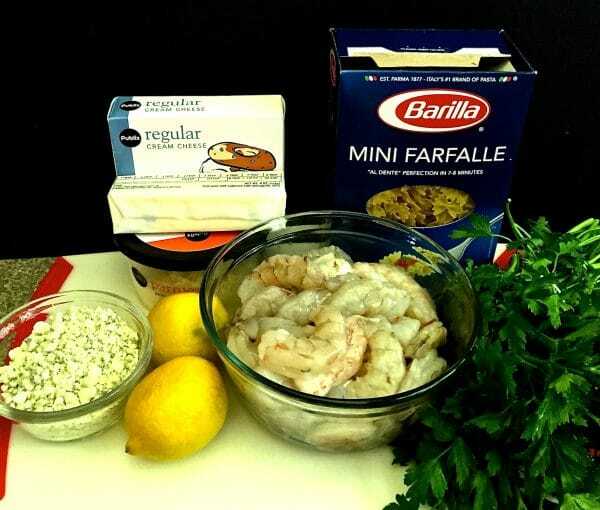 Shrimp and Blue Cheese Pasta only take a few ingredients: fresh Gulf of Mexico shrimp, limes, butter, cream cheese, blue cheese or gorgonzola, bow tie pasta, lemon juice, grated parmesan cheese and fresh parsley. To make this yummy dish, gather your ingredients and preheat your oven to 400 degrees. Spray a medium-size baking dish with non-stick cooking spray and arrange the shrimp in the bottom. Sprinkle with lime juice. 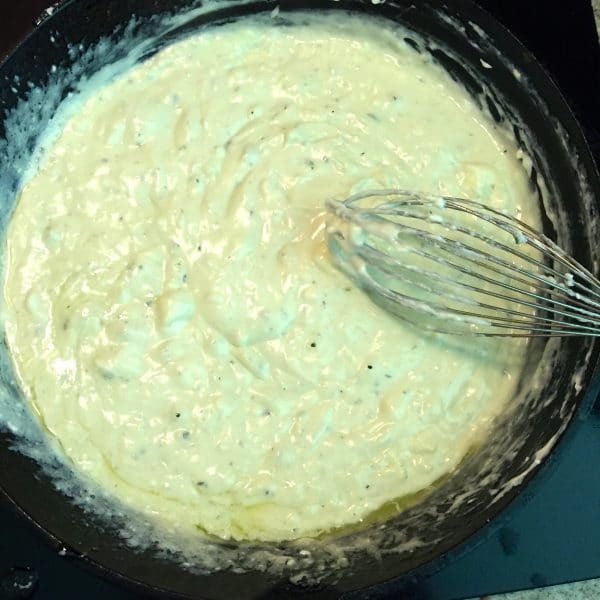 Put the melted butter in a heavy skillet over low heat and add the cream cheese and blue cheese. Stir constantly until everything is melted. Pour this sauce over the shrimp and bake for 16-18 minutes for medium shrimp and 20 minutes for large shrimp. While your shrimp are baking, prepare the pasta according to the directions on the package. Drain and place in a large serving dish. Add 1 Tbsp melted butter, the lemon juice, and parsley and toss to coat. Pour the shrimp mixture over the pasta and mix well. Sprinkle with grated parmesan cheese and garnish with additional parsley if desired. Serve immediately. 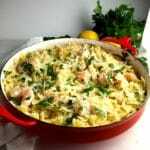 Shrimp and Blue Cheese Pasta is tender, juicy Gulf shrimp mixed with a decadent blue cheese and lime juice sauce over yummy pasta covered with parmesan cheese. Spray a medium size baking dish with non-stick cooking spray and arrange the shrimp in the bottom. Sprinkle with lime juice. 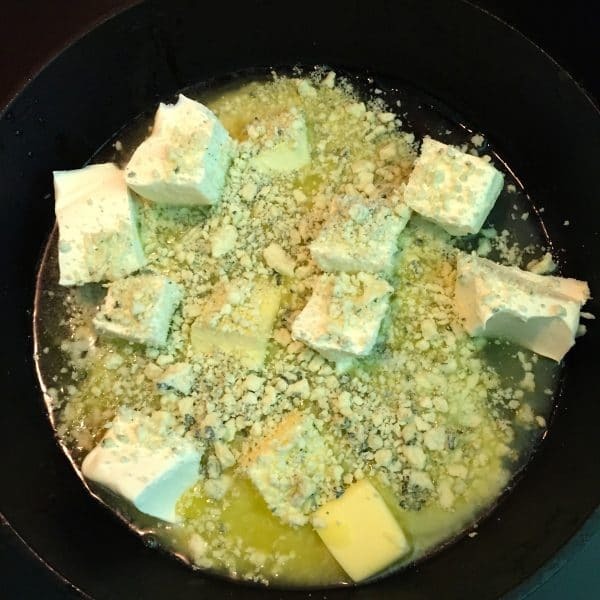 Put the melted butter in a heavy skillet over low heat and add the cream cheese and blue cheese. Stir constantly until everything is melted. Pour over the shrimp and bake for 16-18 minutes for medium shrimp and 20 minutes for large shrimp. While the shrimp is baking, prepare the pasta according to the directions on the package. Drain and place in a large serving dish. Add 1 Tbsp melted butter, the lemon juice, and parsley and toss to coat. Pour the shrimp mixture over the pasta and mix well. 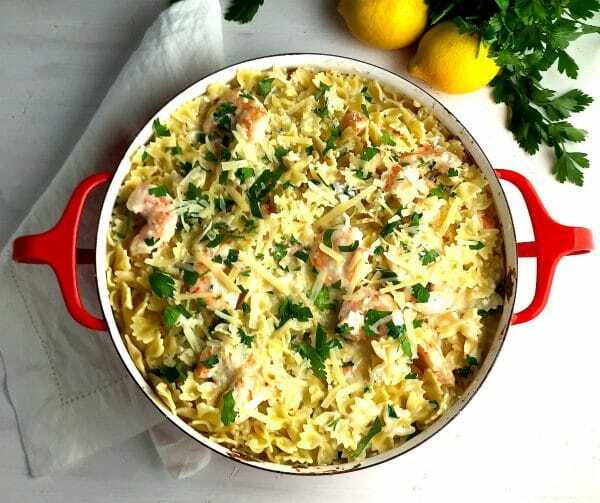 Top with grated parmesan cheese and garnish with additional parsley if desired. Serve immediately. I can hardly wait to try this recipe. If I lived in your town, I would get on my knees and beg to be in your cookbook club! If you lived here, I would get down on my knees and beg you to join us! The juice of two limes does not change for the number of servings. I made the recipe for three, and the citrus was overwhelming. I’m so sorry that you had a problem with this recipe. I was excited to be able to offer a way to easily modify the recipes on my blog for a different number of servings but it isn’t helpful if it doesn’t work correctly. I am disabling it and apologize for any problems it caused you. This recipe is one of my “go-to” recipes and I make it all the time especially when we have company. I hope you give it another try. 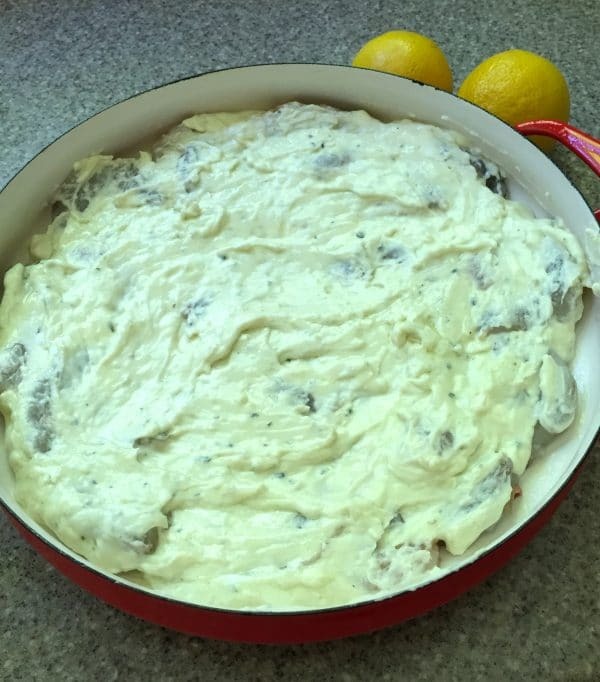 Love, love, love this recipe–what a treat, especially for company and large groups! Thanks so much for the kind comments Mary! Coming from someone who cooks as well as you do, that’s high praise! Wow! This was fantastic!!!!! I make a few adjustments because I’m not a huge fan of citrus and I only had one pound of shrimp. I added a tablespoon of garlic to the shrimp sauce and doubled the amount of parsley. Thanks for sharing! I really enjoyed this recipe and I can’t wait to make it again. Hi Audra, I’m so glad you liked it. It is one of my favorites too and I serve it often, especially when we have company for dinner. Thanks so much for sharing!